What does SLC30A10 mean to you? Chances are: not a lot. To, Somshuvra Mukhopadhyay, a pharmacologist at UT Austin, however, SLC30A10 might hold the key to helping battle Parkinson’s disease. 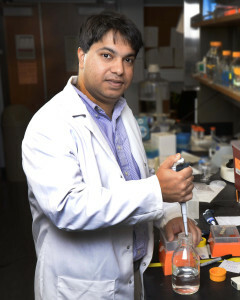 Dr. Somshuvra Mukhopadhyay is an assistant professor of toxicology and pharmacology at The University of Texas at Austin. At the Mukhopadhyay Lab, he is working to understand how intracellular trafficking regulates physiologically relevant cellular processes and how defects in trafficking alter cell physiology to induce human disease. It starts as a slight tremor in a hand and gradually worsens. Parkinson’s disease and parkinsonian disorders affect more than half-a-million Americans. No cure currently exists. While its specific cause is unknown, scientists have long suspected a link to a combination of genetic mutations and environmental toxins. Earlier studies of families with numerous cases of parkinsonism led scientists to look closely at the gene, SLC30A10. It was believed to play a key role in the disease although its function was not understood – until now. Our team in the College of Pharmacy recently discovered that in healthy cells, the protein coded by the gene resides on the cell wall where it acts as a transporter to remove excessive levels of the metal manganese from cells. The excess manganese is then excreted from the body. In small quantities, metals such as manganese are necessary for cells to function properly. We further discovered that problems develop, when mutations of the gene impede its function by causing the protein to become trapped within the cell. When this failure occurs, excessive amounts of manganese eventually find their way to the brain, which leads to the development of parkinsonism. In addition to gene mutations, parkinsonism can be caused by excessive exposures to manganese from occupations such as welding and mining, or from consuming tainted drinking water and foods. With our published findings, researchers can now focus on developing drugs that help rid the body of excess manganese and hopefully prevent the neurological damage and suffering that parkinsonism due to manganese poisoning has caused throughout the world.